Hebron is located 30 kilometer south of Jerusalem. Jewish settlers and Arabs are living side by side on narrow space making the city a focal point inside the occupied territory of the West Bank. The breaklines of the conflict divide houses and roads and mark every day life. 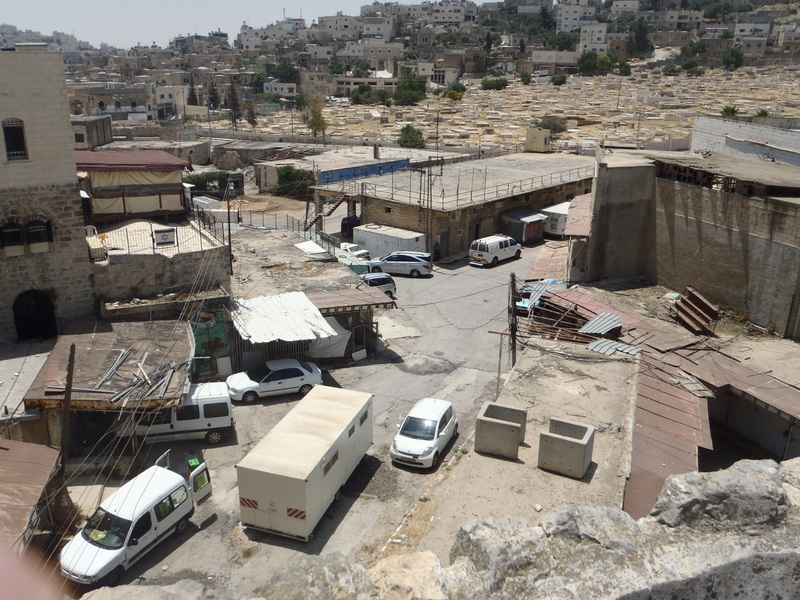 The Arabic souq in Hebron; old houses of stone casting their shadows into narrow alleys. Merchants selling olives and spices, tea, gossip and politics of the day. Under the cloudless blue of a summer day a mesh wire fence clamps across the alley. Underneath the fence are the shops of the Arabs, above apartments. An Israel flag marks them as property of the settlers. “From up there they dump garbage and urine down here”, says Ashraf. Bottles, piles of paper and plastic are entangled in the mesh wire fence. 850 Israeli settlers are living in the old town, in middle of the Palestinian neighborhood. 650 soldiers are to provide their security: watching towers, cameras, patrols, curfews, and checkpoints. In the name of security the military has closed whole streets for Palestinians, the access to the old town blocked with concrete blocks, closed down an Arabic souq and numerous shops. Hebron is a divided city. With his black sunglasses and the aluminum water bottle hanging around his shoulder, Ashraf looks like a tourist. But his steady steps through the alleys and the many Salams he gives to the folks show that he is familiar with the place. Ashraf is a taxi driver and tour guide. He lives with his family in the Aida refugee camp near Bethlehem. For Ashraf the Shuhada street in Hebron is closed. Palestinians are not allowed to enter. Once it was a busy market street. Today shops are barricaded. The few Palestinians still living in the street must leave their houses through the rear exits. Invalids have to be carried on loop ways to the next hospital. Rescue vehicles are not allowed to cross the checkpoint. The road lies deserted in the heat. Two soldiers with a German shepherd dog are sitting in the shadow of a presidio. Attached on the dusty fronts of the houses are boards, telling the history of the Jews of Hebron in English and Hebrew: In August 1929 Arabs looted Jewish houses and shops, burning down synagogues, killing 67 Jews. The fact that many Jews have been saved by their Arabic neighbors is not disclosed by the boards. Many of the shops in the Shuhada street, the boards are telling, belonged to Jews till 1948. When Jordan occupied Hebron the owner had to leave them. Until the Israeli occupation of the town in 1967 no Jew lived in Hebron. 1994 the Jewish settler Baruch Goldstein shot 29 Muslims while they were praying inside the Tomb of Patriarchs. Goldstein was overwhelmed by an angry mob and battered with a fire extinguisher. In the following riots more people died and many had been injured. His tomb lies in the Jewish settlement of Qiryat Arba on the fringe of Hebron. Religious-nationalistic groups venerate him as a martyr of God – this fact the boards are concealing as well. Ashrafs friend lives wall to wall with Israeli settlers, with small stairs leading on the rooftop of his house. Barbed wire fence separates the Palestinian family from the Jewish neighbors. Windows are bared. Cameras of a near watching tower follow each movement in the alleys. The settlers want to buy the house, Ashraf tells. But his friend doesn’t want to sell it. Ever since the settlers make his life miserable. A few weeks ago his water tank ran out, after bullets from a Jewish rifle have riddled it. Infringements occur daily in Hebron: Jews against Arabs, Arabs against Jews and in between the military with the task to secure Jewish settlers. Random arrests, road barriers, curfews, ID-controls and occupation of houses are commonplace for Palestinians in Hebron. An insane reality, calls a former Israeli soldier the setting in Hebron. His testimony is one of more then 700 which were collected by the organization Breaking the Silence. “The situation is simply absurd, living so close to each other, with such terrific tension – not much good can come out of it.” What drives Jewish settlers to come here and live in the midst of 160.000 Palestinians? Midday heat over Hebron. In front of a military post a Palestinian is waiting. A soldier controls his ID in the shadow of a parasol. Muslims enter the Tomb of Patriarchs through a checkpoint. Ashraf has to empty his trouser pockets: cell phone, ID-card, car key. A staircase leads to the entrance of the Mosque, guarded by two border policemen with green berets, protective vest and assault rifles. One of the many military posts in the old town of Hebron. Under the high vault of the Mosque it is pleasant cool, small fans buzzing, monitoring cameras observing the praying people. Cenotaphs tagging the places where in the caves beneath the tombs of Patriarchs are supposed to lie. A barred window allows a glimpse into the Jewish part of the grave. Following the tradition of the Old Testament Abraham and his wife Sarah, Isaak, Rebekka, Jakob and Lea have been buried in Hebron. Jews, Christians and Muslims alike venerate the tombs. Rarely together, as more often one religious community excludes the others from the place or banished them. For Jews Hebron is the second holiest town after Jerusalem. But the conflict not only revolves around the access to the sanctuary. It is about land ownership. Inside the old town of Hebron there is struggle about houses, backyards and streets. With the presence of the Jewish settlers the military excuses roadblocks, curfews and the evacuation of Palestinian shops and markets. In the end these actions aim to banish the Arabs from the old town of Hebron. Israeli settlers argue the land seizure with the historic-religious bond of the Jews with Hebron. Their ambition stands against the hope of the Palestinians of an independent state. In 2004 soldiers of the Israel Defence Forces (IDF) decided no longer to keep silent about what they saw and did in Hebron. Breaking the Silence by now has more than 700 testimonies of former soldiers published. These are tales about violence by settlers and about repressions by the military against Palestinians. If settlers assault Palestinians most times the military looks the other way. In many cases, juridical framework is lacking and the military is not permitted to intervene. The law of war is applied to the Palestinians, the Jews in the West Bank are subjected to Israeli law. According to Israeli law, children under the age of twelve are not subjected to this law, as they are minors. This is the reason why many settlers send their children to spit on Arabs, throw stones on them or destroy their property. Protection through the military and the juridical betterment gives agent provocateurs in the ranks of Israeli settlers a free rein. Through the testimonies of the soldiers and tours to Hebron Breaking the Silence wants to show the people in Israel what is happening in the occupied territories. By accepting the violence of the settlers, Israeli society bears responsible for what is going on. They have to become aware of this responsibility.